The first representative New Zealand rugby team played its first match, defeating a Wellington XV 9–0 at Newtown Park. The team then embarked on a tour of New South Wales, where it won all its eight games, scoring 167 points and conceding only 17. 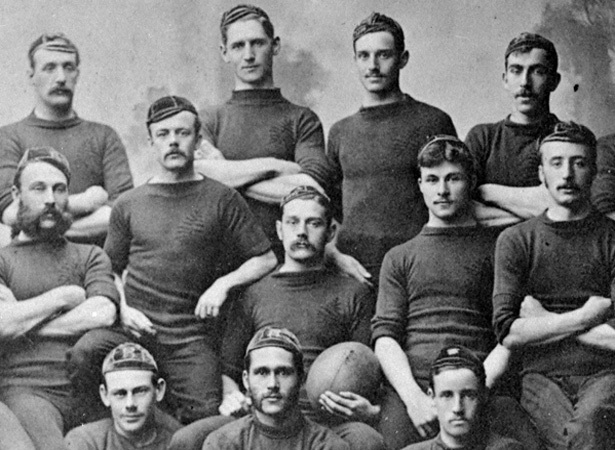 The New Zealand Rugby Football Union was not established until 1892. Until then tours were privately organised. The provincial unions nominated players for selection, sometimes on a quota basis. This team was led by Canterbury barrister William Millton, who along with the team’s manager, Dunedin businessman S.E. Sleigh, made most of the arrangements. Millton finished as joint top points scorer and was described by Sleigh as ‘the right man in the right place. A steady dribbling forward, always near the leather. His good-natured unselfish play tended in no small degree to make the games pleasant and at the same time successful.’ Unfortunately, Millton died in 1887 of typhoid fever. In 1888–89 a ‘New Zealand Natives’ team of mostly Māori players toured Britain − the first New Zealand team sent to the northern hemisphere. We have 21 biographies, 14 articles, related to First New Zealand rugby team in action.